Although, Istanbul Flower restaurant does not have that lavish interior that one can expect from an eatery in Jumeirah, but the food is the real deal in this case. As this establishment serves absolutely scrumptious Turkish delicacies that will make you forget the slight tacky decor of Istanbul Flower. Because people of Dubai do not come here for visuals, in fact they come here to relish authentic fare that has made this venue a sure-fire hit, especially among the Turkish expatriates. The approach of this restaurant is also quite easy, as it is located under Safestway Super Market on Sheikh Zayed Road in Jumeirah, Dubai. So patrons of Istanbul Flower would not face any problem in getting to this bistro. The scrumptious Turkish food of this bistro is highly impressive, as chefs pay attention to each detail while preparing a dish. Plus they make these dishes in typical home style. Despite of it, this simple food tastes completely celestial. Its menu is vast and mainly dominated by heavy meat dishes. It includes all time Turkish favorites like array of kebabs and a variety of mix juicy meats presented with different ingredients. In short, one can surely say that this restaurant provides best authentic Turkish fare in the town. Outdoor seating facility makes the ambiance of this eating place even more dreamy, as guests enjoy pleasant weather and take pleasure in the stunning views of Jumeirah Beach together with the food. 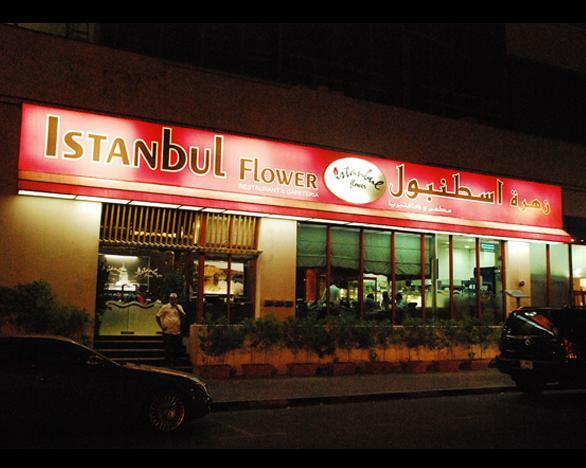 To see the menu of Istanbul Flower, click here! This restaurant opens daily and its operational timings are from noon till 1:30 am. Underneath Safestway Super Market, Sheikh Zayed Road, Jumeirah - Dubai - United Arab Emirates. Head southwest towards Sheikh Zayed Collector Road from this metro station then turn right onto Sheikh Zayed Collector Road and the destination will be on your left side after covering some distance. Use bus number 7 0r F16 and get to Shaik Zayed Road, Safestway – Dubai bus stop that is hardly 47 meters away from Istanbul Flower restaurant and 37 seconds walk. All bus users need to do is to head in the northeast course on Sheikh Zayed Collector Road and soon they will be able to locate the destination. 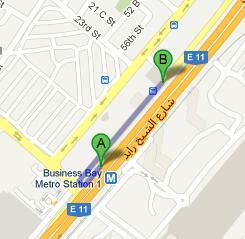 View map for directions.